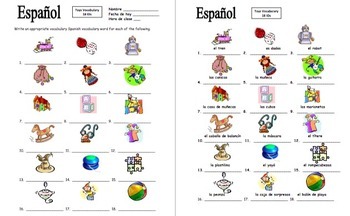 Students write the Spanish toy vocabulary word under each of the 18 pictures. Examples of toys included are puppet, doll, dollhouse, marbles, train, and puzzle. This activity is helpful when working on the Spanish imperfect and childhood. When finished, the handout makes a nice review sheet as is or it could be cut apart later and used for flashcards. The answer key is included. 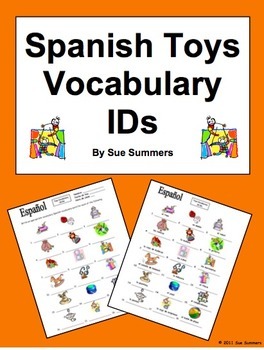 Please click here to see more of my Spanish vocabulary IDs materials.